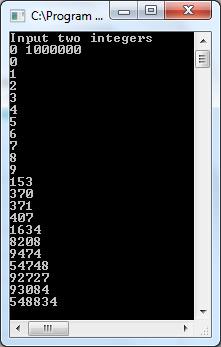 C program to generate Armstrong numbers. In our program, a user will input two integers, and we will print all Armstrong numbers between these two integers. Using a for loop we will check numbers in this range, in the loop, we call function check_armstrong which returns '1' if a number is Armstrong and '0' otherwise. If you are not familiar with Armstrong numbers see Check Armstrong number program. Download Generate Armstrong numbers program.